A fun activity toy for your pet. 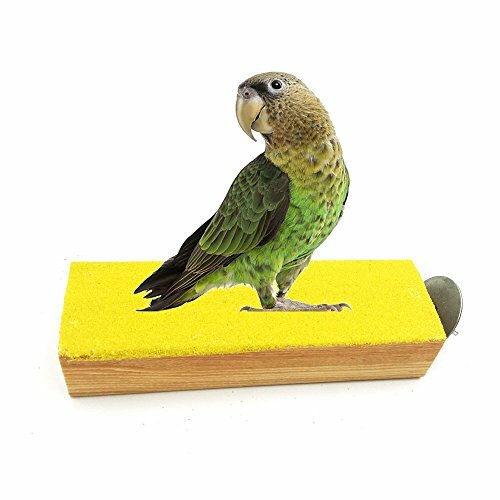 Long lasting activity center for parrots. 1. IT'S THE HANDMADE CRAFT, THE COLORS MAY BE DFFERENT FROM THE PICTURES, WE WILL SEND THE COLOR BY RANDOM, HOPE YOU CAN KINDLY UNDERSTAND. 【100% NATURAL AND NON TOXIC】 Borange bird perch is made of 100% natural wood, ecofriendly and enviromental protection, safe for your lovely birds. 【PERFECT SIZE】With the size of 15*4*1.8cm, perfectly suit for many sizes birds. 【EASY TO INSTALL】 Each hardwood bird perch is fully outfitted with a metal wing nut and a built-in bolt. No extra equipment is required for installation and the perches deliver a secure hold. 【EASY TO CLEAN】 Easy to clean with soap and water directly. PACKAGE INCLUDES 1PC BIRD PERCH ONLY. IT'S THE HANDMADE CRAFT, THE COLORS MAY BE DFFERENT FROM THE PICTURES, WE WILL SEND THE COLOR BY RANDOM, HOPE YOU CAN KINDLY UNDERSTAND. If you have any questions about this product by Borange, contact us by completing and submitting the form below. If you are looking for a specif part number, please include it with your message.